Home » Argentina » Riding On A Vintage Subway! Riding On A Vintage Subway! Through all my rather obsessive planning for our trip to South America, and to R’s perverse glee, I somehow overlooked the fact that our dates coincided with the presidential elections in Argentina. I realised my blunder when the Buenos Aires soccer schedules were released and I couldn’t find a single match for the entire week that we were going to be there. But the upside was a Sunday morning free of crowds to ride the vintage Line A of the Buenos Aires Subte, and check out the legendary Cafe Tortoni at leisure without having to stand in (the equally legendary) line. I can’t possibly be accused of not being able to look on the bright side, can I? 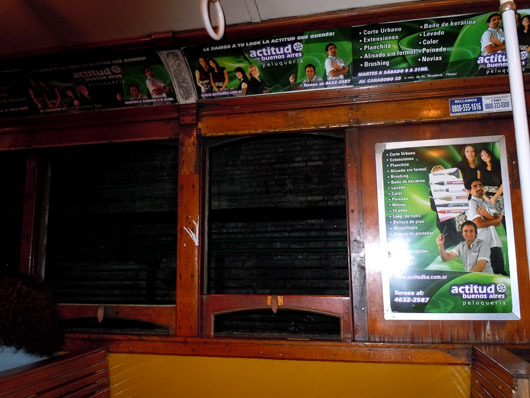 Estacion Peru still retains most of its original decor! 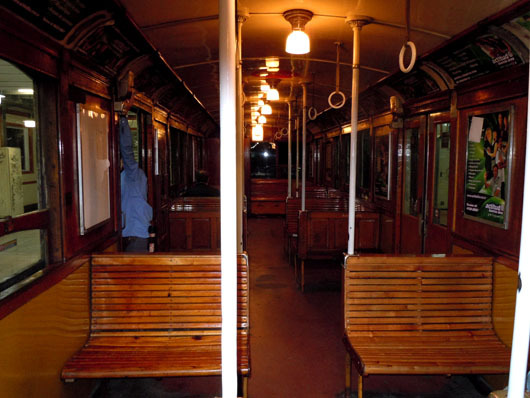 Tha A line was the first subway line in Buenos Aires. Opened in 1913, this is the 13th-oldest subway system in the world, the oldest in South America, and the fourth-oldest in the Americas as a whole (after New York, Boston, and Philadelphia)! An original wooden car of the A line, nearly to ourselves, since most self respecting Portenos were busy choosing their president! 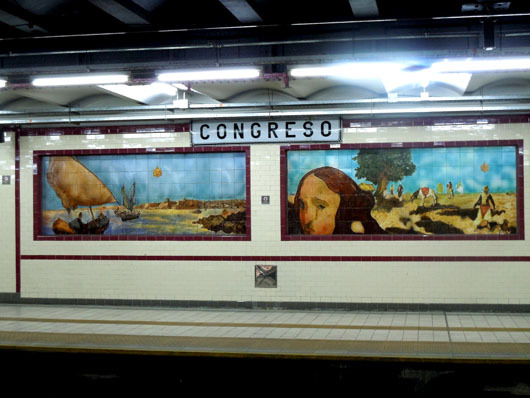 Tile murals in the Estacion Congreso. 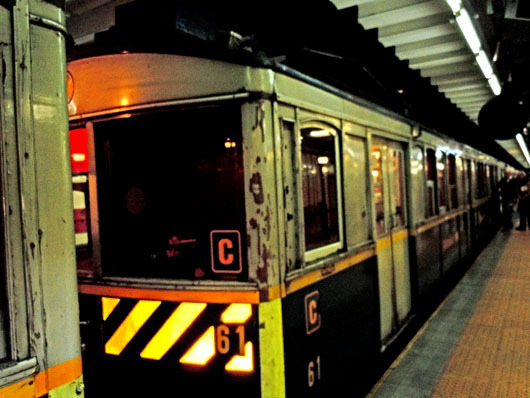 The A line runs under Avenida de Mayo – from Plaza de Mayo through Congreso, its original terminus, to Carabobo. This is great, Madhu. When we were down there last summer we wanted to ride one of the old subways, but they were always so crowded. We peeked from the outside, but I don’t think we ever actually rode in one. I love that they are still in use. Thank you Naomi! One of the few benefits of that being election day 🙂 I doubt these wooden cars will be in use for very long. Some have already been replaced by shiny new ones! Amazing shots Madhu..loved the fact that these vintage cars still operate ,they have a charm none of the newest brands can match up too.. 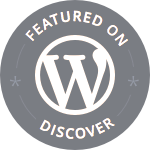 I love visiting your selections for your posts, Madhu … I always know I’m in for a treat. Again, I am impressed with your photos and the story behind them. What a wonderful old subway train. Like you, I admire the old elements that are no longer seen today and appreciate the history behind old relics such as this subway. Nice share. Happy to hear that Marcy 🙂 Always a pleasure to share my passion with readers who appreciate it! And to have got it almost to ourselves 🙂 BsAs subways are way too crowded normally for picture taking! That is so so cool!! Love it! Me too 🙂 Thanks Anne! Believe me the Soccer and the Feria would have been even better 😦 But yes, we did salvage much of the day. Thank YOU for the wonderful prompt Jake! I like the reminder that it is possible to continue to use and repurpose things. In China anything even remotely old tends to get trashed for the “new and better” version. This was refreshing. In India too! Even historical buildings!! Thank you for the visit and comment! Lessons learnt 🙂 Thanks for the visit Amy! Very charming. Awesome to ride in this vintage train. Not only are the trains beautiful but the stations look spotless too. Really nice! Hey, great shots Madhu! The interior is fantastic!! What a time capsule. Love the sash windows and those light fittings are grand! They don’t make them like that anymore. I much prefer this to the metal and plastic tubes we cram into nowadays. Hopefully they’ll become a museum piece. I do too Louise! (Although we could do with a subway of any kind in our city!) I think there are just a couple left on this line, so just a matter of time before they are reduced to being exhibits in a museum. What a cool post! 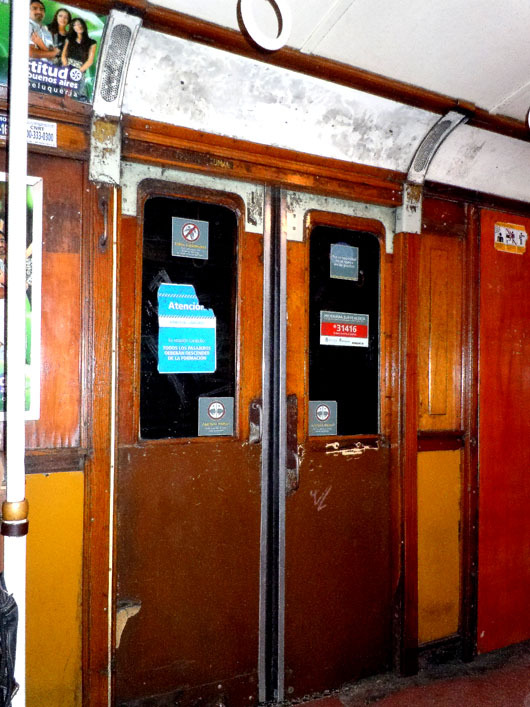 I had no idea that these old subway cars existed in BA. Otherwise for sure I would have checked them out. We did take the subtle a few times though. I love this kind of stuff! Isn’t Argentina grand?! Perhaps the best food and wine in the world too! My research stands me in good stead 🙂 R finds it amusing and I feel he hopes things will go wrong sometimes, the wicked man!! You are right about Argentina…the best helado too! I love an optimist! These vintage cars are fabulous, I do enjoy the old classic look of yesteryear. What better way to spend a Sunday morning! Great photos. These are amazing photos. But my favorite is the first one in the station! Love the yellow color and the lines. Thank you Arnel! That station was really pretty (and clean)! Excellent photos, and I can’t help being reminded of trams in Mebourne when I was a kid, or the old trains – there’s something lovely about the wood rather than the plastic/metal constructs they have now. Thank you! You are lucky to have seen those! I feel sad that the grandkids will never know anything but plastic and metal! 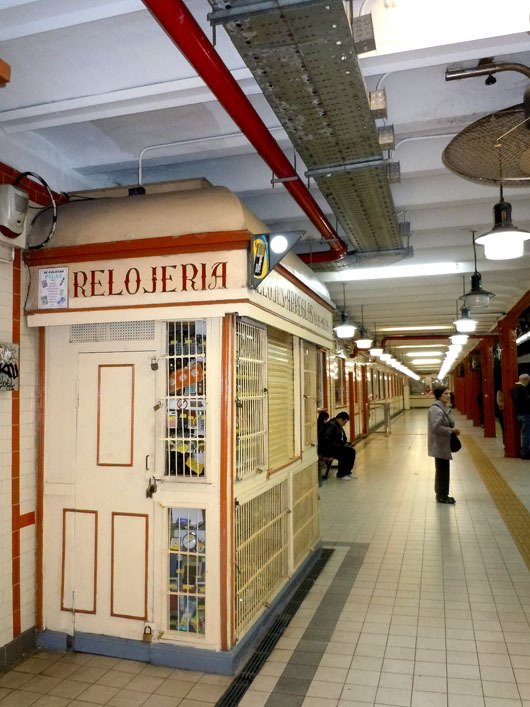 you composed a great gallery for the subway of Buenos Aires! That is pretty cool! I am sorry you missed out on a game though but when stuff like that happens, and it happens to all travelers, the best is to look for the bright side. This is soo cool, Madhu! And Argentina is certainly one place I’d like to visit. Oh, well, good for you to go along with them, heh. I wouldn’t miss the experience! And nowadays I pay more attention in order to have something to talk to the older boy about 🙂 And yes, we were very lucky to have that subte car to ourselves! What a unique subway and I would consider myself very lucky that it was such a quiet day! love the wooden seats and the tile art! We were very taken with BA subway too – all that wood! But I only took a photo of Cafe Tortoni and didn’t actually realize it was a landmark until later – I took it for the beautiful doors!